Where is the Elder Scrolls 6’s setting? Finally, The Elder Scrolls 6 has been announced. Breathing a sigh of relief the world over, Dovahkiins of all shapes and sizes were rewarded for their years of waiting as Bethesda’s E3 2018 conference came to its euphoric close. But, since we can never be satisfied, we want to know even more about our next fantastical destination; where is the Elder Scrolls 6’s setting? In the Bethesda’s agonisingly short 30-second Elder Scrolls 6 announcement trailer, we see the camera pan over, well, not a lot, actually. As the mist subsides and that familiar orchestral tune swells, we see a craggy collection of mountains and grassy hills. The remains of castles and the ruins of an erstwhile civilisation are scattered across a landscape that borders a coastline of crystal clear water. So, where is this mysterious Elder Scrolls 6 setting? We might be waiting for one for some time, but here is everything we know about the The Elder Scrolls 6 release date. From High Rock to Hammerfell, here are the possible Elder Scrolls 6 settings and how likely we think they will turn out to be the real deal. Here is where we think The Elder Scrolls 6’s setting will be. High Rock is in the north-western corner of the Tamrielic Empire and is the home of the Bretons, or Manmeri. It is a place known for its fertile soil, grey skies, and dry weather, which certainly fits the landscape we saw in the Elder Scrolls 6 trailer. The coastline we can see could be the Iliac Bay and the ruined castles could be a result of the squabbling over territory and resources in the Fourth Era. The, where there were 100 smaller kingdoms, there were only five left. Neighbours of High Rock, Hammerfell is the home of the Redguards. Most importantly, it is a region with the undulating mountain ranges that could resemble the teaser trailer and a massive open desert called the Alik’r. It has the long coastline we are looking for, too. 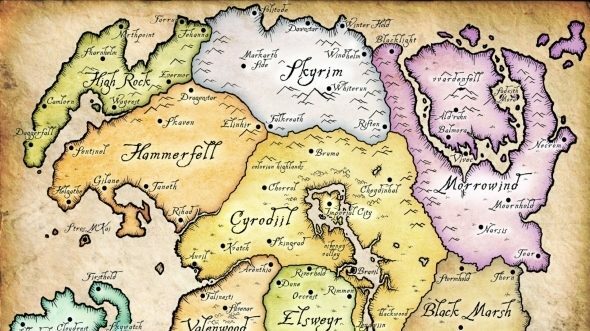 If The Elder Scrolls 6 is set anywhere, our money is that we will be adventuring in the north west of Tamriel. What if The Elder Scrolls 6’s setting isn’t in Tamriel at all? If we look across the pond from the Tamrielic Empire we can see Akavir, a diverse ‘Dragon Land’ home to a collection of peoples known as the ‘Akaviri’ – that’s the Snow Demons of Kamal, the serpent men of Tsaesci, and the Monkey People of Tang Mo. Humans lived their once, but were rumoured to have become Akaviri dinner. Akavir and Tamriel share a tumultuous relationship throughout Elder Scrolls history, which would make a great backdrop for TES 6. The Wood Elf home of Valenwood was a heavily rumoured Elder Scrolls 6 setting as E3 2018 approached but, given the footage we have seen in the teaser, this largely uninhabited forest wilderness in the south west of Tamriel doesn’t seem to fit. That said, it’s coast does look out to the Abacean Sea, so perhaps this is the body of water we can see in the trailer. Black Marsh might not just play host to the next Elder Scrolls Online expansion, it could also be The Elder Scrolls 6’s setting. You might know Black Marsh better as Argonia, or even as the ‘Garbage Heap of Tamriel’ – which we doubt was a moniker bestowed on it by its Dunmer denizens. 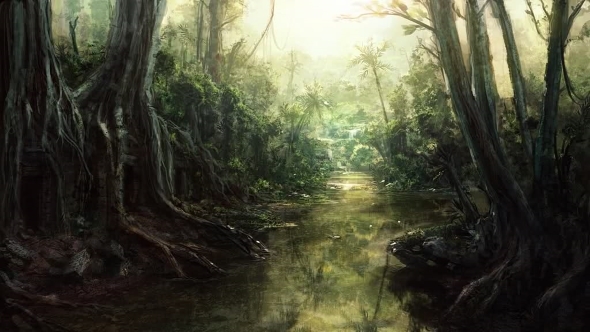 The swampland rainforests and inland waterways of Argonia don’t really fit with the reveal teaser but, if The Elder Scrolls 6 is as varied as Skyrim – which we’d hope – then the announcement trailer could easily be showing an as-yet-unexplored patch of Black Marsh.